Both Burnley and Lowerhouse started their Fosters Lancashire League campaigns with a victory on Sunday. Burnley beat Bacup by nine wickets at My Protein Turf Moor, while champions Lowerhouse travelled to East Lancashire and came away with a two-wicket success. 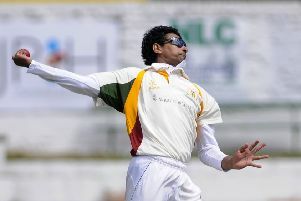 At Turf Moor, skipper Bharat Tripathi won the toss and inserted Bacup. And Graham Lalor soon opened his account with the wicket of Matt Collinge. Jhangir Liaqat then took the wicket of Tim Farragher to make it 26-2. There was a partnership between Adam Highly and Henry Butcher which took the score on to 60, but then Dan Pickup took the first of his three wickets (3-10 off 6.3). Tom Lawson came back into the attack after a good opening spell, then took the wicket of visiting professional Haseeb Asam. The visitors suffered a collapse, as, from being 80-4, they subsided to 99 all out, as professional Chris Holt ended with 4-28 off 10 overs. In reply, Burnley lost Vishal Tripathi for four to Azam, but it was left to Holt (36 not out) and David Brown, with an entertaining, hard-hitting 58 not out, to see the locals to victory in less than 16 overs to get maximum points. Next week sees the visit of Enfield on Saturday, followed by a trip to Church on Sunday. Meanwhile, Lowerhouse opened the defence of their title – as they look for a fourth league win in five years – with a hard-fought two-wicket win at Alexandra Meadows in Blackburn. Having won the toss, Lowerhouse chose to field, and returning professional Cobus Pienaar took 6-38 and Fergus Bailey 3-30 to restrict East Lancs to 138. It was Bailey who picked up the first wicket of the season, having Mini Bhada caught at slip by Matt Walker for 2 in the second over of the match. Pienaar claimed his first wicket when he trapped the dangerous John Turner lbw without scoring at 15. Four runs later Pienaar ended the innings of his Northerns and Titans team mate, East Lancs professional JP de Villiers, in the same manner for 4. Veteran Mark Lomas and Mo Bhada came together to stage a fightback, with Lomas making 21 before falling to Walker. Paul Kelly was well held by youngster Joe Halstead off Bailey without troubling the scorers, before home skipper Mark Bolton became the fourth lbw victim of the innings, again to Pienaar. Mo Bhada’s stubborn resistance was ended by an excellent diving catch behind by Joe Martin off Pienaar, before Shahrukh Khan joined forces with Chris Riley, making a quick 13 before being well held at long on by Lewis Marsden off the bowling Bailey. Riley’s innings of 25 was ended with an excellent return catch by Pienaar, who then wrapped up the innings by bowling Nick Turner for 12. 138 looked a good score in difficult conditions. In reply, Khan removed Jonny Whitehead first ball before a run had been scored, and then snared Joe Martin for 17 with the score on 29. DeVilliers then took a brilliant one handed catch at cover off Khan to pick up the wicket of Pienaar, before clean bowling Walker for one. Paddy Martin and skipper Charlie Cottam steadied the ship before Martin played on off the bowling of Devilliers and then Cottam fell for 43 to an excellent catch behind. Chris Bleazard was then clean bowled by Minhaj Bhada, leaving Lowerhouse in trouble at 99-7. Fergus Bailey and Josh Lavin fought back with a stand of 29 before Lavin was harshly adjudged lbw to Minhaj Bhada for 12. However, Bailey was unmoved, smashing a straight six off Bhada before hitting the winning runs with 5.4 overs to spare. Fergus Bailey finished unbeaten on 34. Lowerhouse are at Ramsbottom on Saturday and host Accrington on Sunday.